Manager Keith Curle has admitted supporter unrest at Carlisle United is a "concern" and tried to reassure fans of the commitment from the board. By Monday lunchtime, 851 United fans had signed an online petition calling for the directors to sell the club. Supporters have also planned a show of protest for the home game against Mansfield on Saturday, 31 January. "Is it a concern? Yes. Does it show a lack of unity? 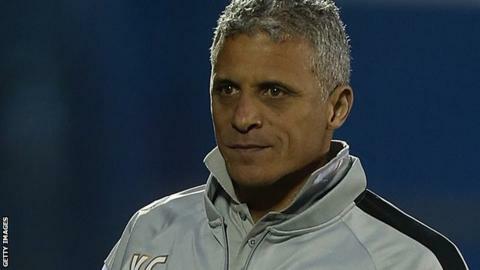 We need to unite," Curle told BBC Radio Cumbria. "We can't have infighting, I'll make sure everyone keeps focused. "I've got a fantastic relationship with the owners, I've been helped in everyway possible. Everything that can be shifted my way financially is being shifted my way." Carlisle won the Johnstone's Paint Trophy as recently as 2011 and just missed on gaining a place in the League One play-offs the following year, a feat they had achieved in 2007-08 before losing to Leeds over two-legs. However, the Cumbrians were unable to maintain that form and last year's relegation came after long-standing manager Greg Abbott was sacked, and replacement Graham Kavanagh only lasted a year. Curle took over from Kavanagh at Brunton Park in September, and began his tenure with three consecutive league wins. Form has been mixed since then, but it has been the board rather than the team that has been the target of most criticism in recent weeks during a run of three successive defeats, and Curle wants to address those concerns. "People get frustrated if they don't have the lines of communication," the 51-year-old continued. "One thing I enjoyed when I first came here was the interaction I had, staying in the hotel and going out on the city and speaking to people. "I'm going to start doing that again, I need to speak to people, so if you're frustrated about football and you've got questions, come and speak to me. If I have an answer I'll give it." The crowd for Saturday's 1-0 home defeat by Cambridge was the season's lowest, with only 3,406 through the turnstiles. However, former Chester and Notts County boss Curle is adamant the backing for the players remains intact. "The level of frustration from supporters, I'm aware of it, I hear it throughout the game," Curle added. "The pleasing thing is it's coming out of frustration, it's not out of a lack of support. They are desperate for us to do well, but can I ask them to be a bit more patient? I have to."